1. Do you service other brands of watches? A.) Yes we do, we repair your fashion watches as well if your brand is not listed below please contact us Fossil, Kenneth Cole, Guess, Luminox, Seiko, Bulova, Skagen, Swiss Wenger and many more and we can provide you with all links, bands,crystals, crowns, cases and other parts. 2. Are you a Rolex Factory Service Center? A.) 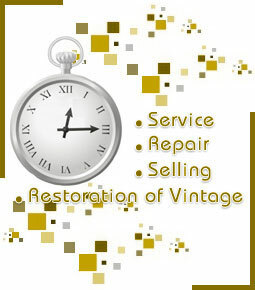 We are proud to say watch repair shop is an independent business not affiliated with any factory repair center. We stand behind all our repairs 100%. If you are looking for a factory warranty repair center please email us and we would be happy to get you the correct info. 3. How often should I have my watch serviced? A.) you should get your timepiece serviced every 3 to 5 years depending on your usage. Remember you change your oil in your car every 3000 or 5000 miles and you drive you car est. 1 to 2 hours a day. Your timepiece runs 24 hrs 365 days a year so you should give your timepeice the same if not more care. 4. How long does it take to get my watch serviced? A.) Our normal turn around time for servicing your watch is approximately ten to fourteen working days. If parts are not in stock, as with some very old watches, then it may take slightly longer. 5. After my watch is serviced, how accurate will it be? A.) Time keeping accuracy of any mechanical watch is between 0-10 seconds per day. We use a timegrapher to make sure we get you the best accuracy. Magnetism, temperature and abuse may cause the watch to perform above normal limits. When we overhaul, clean, rebuild or tune any timepiece we warranty the repair 12 months. Please take in consideration any mishandling, banging, dropping, water damage from unscrew crown or broken crystal of the watch or band is not under warranty. All timepieces are checked for time accuracy, gaskets and water tested before sent back to customer.